We help you develop sanitary procedures to optimize productivity and maximize safety. Managing a food sanitation program can consume a substantial portion of an organization’s operating resources. By outsourcing these services to BSA, our customers spend more time focused on their business. 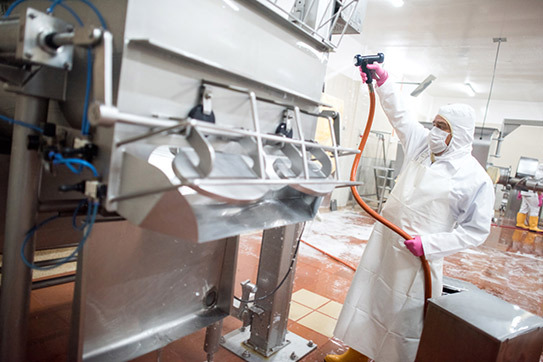 BSA follows a set of standardized and deliberate processes to help our clients control costs and reduce their operating expenses, optimize productivity and ensure high food safety standards are met. Our experienced employees work closely with our customers’ quality control department to develop proper sanitation procedures that are in compliance with industry standards. We accomplish this through written food sanitation procedures, training and technical assistance, safety management, consulting and knowledge of increasingly stricter compliance regulations. BSA’s janitorial staff can be a large contributor to your LEED and ISO certifications and Six Sigma continuous improvement plans. Our cleaning processes can contribute to your ISO 9000 family of standards for quality management system. ISO 9000 is maintained by ISO, the International Organization for Standardization and is administered by accreditation and certification bodies. The rules are updated, as the requirements motivate changes over time so our cleaning services may need to be modified over a period of time. Some of the requirements in ISO 9001:2008 (which is one of the standards in the ISO 9000 family) include a set of procedures that cover all key processes in the business including cleaning. You can monitor cleaning processes to ensure they are effective, keeping adequate records of cleaning protocols. You can check cleaning processes for defects, and with appropriate and corrective action where necessary, regularly reviewing individual cleaning processes and the quality of the cleaning system itself for effectiveness. This helps to facilitate continual improvement in our industrial cleaning process.